Everyday, we get a ton of questions about what’s better, SAP or Salesforce.com? Microsoft Dynamics or Oracle? How does Sugar CRM fit into the whole mix? Though the questions are common, the answer is not always so easy to provide. So I thought a blog pitting the major CRM solutions against each other might help a lot of our readers. In this two part blog series, I will throw some of the largest CRM names in the squared circle and see if we can figure out who wins out. WWF history actually provides a great lens for an analysis of some of the most widely adopted CRM solutions. Yes, by WWF I am talking about the World Wrestling Federation. 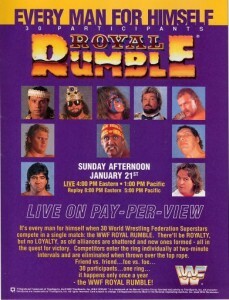 And of all WWF events, which one is uniquely designed to help us along in this blog? None other than the Royal Rumble. 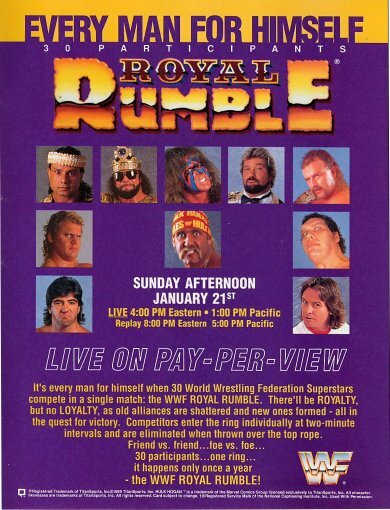 For those of you who are either too young to remember these classic WWF “competitions,” or just didn’t care about them, the Royal Rumble was a huge Pay Per View event that matched 30 or so of the league’s top wrestlers against each other in one long match. Starting the competition with just two wrestlers, every two minutes a new wrestler would be sent into the ring. A wrestler could only be eliminated by being thrown over the top rope of the ring. The winner was the only remaining wrestler still in the ring at the end of the match. So let’s rewind to 1990 (I promise this blog actually does have something to do with CRM). Hulk Hogan was still the biggest star in the WWF. At the same time, there was a relative newcomer who was winning over fans at an exponential rate, the Ultimate Warrior. The Ultimate Warrior lacked the clean cut image that the Hulkster had, but for whatever reason he represented all that was cool for that time period (in retro, he was actually just kind of weird). Anyway, as the Ultimate Warrior rose to prominence, it became clear he was on a one way course towards a head to head confrontation with Hulk Hogan. This first happened at the 1990 Royal Rumble. Now at the end of the day, there were a lot more players than just Hulk Hogan and the Ultimate Warrior. In this blog, I’ve associated each of the major CRM solutions with one of the wrestler’s in this epic match. While every wrestler in the competition had a solid foundation of skills and accomplishments, each of these individuals brought some specific strengths and weaknesses to the ring that made them unique. Similar to the wrestler’s, in this Royal Rumble each of the CRM applications being pitted against each other have the base functionalities that any organization requires from a CRM solution. For that reason, this blog will not focus on obvious CRM functions such as account and contact management, campaign management, pipeline performance management, lead scoring, analytics, etc. Rest assured, all of the solutions being discussed will provide you with the core functions for sales, marketing and customer service executives. Except when it comes to Microsoft Dynamics and SAP, I’ve omitted much analysis around mobility solutions. All of the vendors have their own mobility solutions and a variety of partner developed mobility solutions that provide mobile access to their given CRM system. Though there is still room for growth when it comes to mobility and CRM, no particular vendor differentiates itself enough to warrant much discussion around it. For purposes of this blog we will focus on integration capabilities with other enterprise systems, costs, cloud vs.on premise options, social CRM functionality, and applicability based on company size and/or industry. That being said, lets ring the bell and get started. Who??? That response is exactly why Jimmy Snuka is a good match for SugarCRM. Only the real die hard WWF fans knew who Jimmy Snuka was. Not because he wasn’t exciting to watch or talented, but he just wasn’t that well known. In a competitive field of wrestler’s Jimmy Snuka was a relative newcomer who had some difficulties really differentiating himself from the pack. This is the place where Sugar is in the CRM world right now. Despite not being one of the most well-known, they do provide a quality CRM solution. SugarCRM provides an open source platform that is available both in on-premise and cloud variations. Though Sugar places the most emphasis on their cloud based offerings, they offer on premise versions of their solution as well. From a pricing perspective, SugarCRM prices are on par with Microsoft Dynamics and less expensive than Salesforce for similar functionality. SugarCRM’s “Corporate” package is priced at $540/user/year which equates to $45/user/month. I’ll also note that right now SugarCRM is aggressively targeting Salesforce.com customers by guaranteeing a 50% cost savings for switching to Sugar. SugarCRM’s social media interface is clean and intuitive. For users who want to be able to pull relevant social media behavior of leads, prospects, or contacts, SugarCRM’s social media tool will achieve this. Depending on the organization, the open source platform of SugarCRM could prove to be very advantageous or very confusing. On one hand, customers can literally get started the minute they purchase the edition of their choice from Sugar’s website. However, as anyone who has implemented a CRM solution before should know, some level of configuration is necessary in order to make the solution functional for your organization. If an organization has the internal resources to configure SugarCRM, then the open source platform works great. However, if an organization does not have this expertise in-house they may find that vendors such as Salesforce.com and Microsoft have a more streamlined partner network to assist customers with implementation. Integration with the most established backend ERP systems is another issue that certain organizations may have when considering SugarCRM. There are open source ERP solutions developed for Sugar, but organizations already using SAP or Oracle will have to go through some configuration in order to integrate SugarCRM. Macho Man was a staple in the WWF. He had his share of big wins and was definitely one of the league’s biggest stars. In any given match, fans were never surprised if he came out on top. Similarly, Microsoft needs no introduction to the enterprise software space. Microsoft is well engrained in many organizations at least at some level. And this is where Microsoft Dynamics continually wins. Microsoft Dynamic’s is seamlessly integrated in one of the most widely adopted enterprise solutions in the globe, Microsoft Outlook. This feature alone makes it a great fit for many small and midsized businesses that are already using Microsoft Exchange. One of the primary complaints we often hear from sales and marketing executives about CRM is that it is more of a workforce management tool that adds to their workload rather than something to make their job easier. Microsoft Dynamic’s addresses this concern by ensuring that sales and marketing executives who already use Outlook will be able to access the CRM system from within Outlook. There is no new UI to learn or struggle with making user adoption more likely. As far as backend integrations, Dynamics ERP customers, find that Microsoft Dynamics CRM easily integrates providing one clean end to end solution. Microsoft Dynamics CRM can still be configured to integrate with SAP or Oracle ERP, however the solution will be more expensive and timely than integration work with Dynamics ERP. Microsoft Dynamics CRM is available on-premise or in the cloud. As far as the small business sector, this offering makes Microsoft Dynamics somewhat different than the competition. The other vendors offering solutions for the small business sector only offer limited options for either cloud or on premise options. For industries where housing particular customer data on-premise is a necessity, Microsoft Dynamics provides an affordable solution that does not require a ton of implementation work. From a cost perspective, Microsoft Dynamics is very competitive. At $40/user/month, it is a cheaper alternative to Salesforce.com for the base functionality. If Microsoft Dynamics falls short of the other big solutions in one area, I have to point to mobility. With browser compatibility with Dynamics being limited to Internet Explorer, you can already imagine how difficult pulling data from your Android, iPad, or iPhone will be. Next to impossible. Everyone knew who Andre the Giant was. WWF fan or not, Andre the Giant was a figure in American popular culture that was hard to miss. Andre was once one of the most dominant forces in the WWF. By 1990 however, while still dangerous, he was getting a little old and was not as competitive or beloved as in years past. Similarly, Oracle needs no introduction. I think it’s a safe bet to assume even those who have no idea what Oracle does, have still heard of Oracle. Oracle formally entered the CRM space in 2005 when it acquired Siebel. Along with the acquisition of Peoplesoft in the same year, Oracle established a product line of CRM solutions including both on-premise and cloud. As a CRM solution, Oracle is one of the most widely adopted solutions amongst enterprise sized customers in the world. Oracle provides a robust, highly customizable and scalable solution. With their longstanding experience across multiple industry verticals, they have a set of industry specific configurations that leverage the best practices amongst many of the globe’s most successful companies. Particularly for organizations that utilize Oracle ERP, an Oracle CRM solution makes for an easy integration. When it comes to social media integration, Oracle has made strides to meet growing consumer demands. Also, with such a large install base, a number of Oracle partners have developed social media applications that work within their CRM solutions. They don’t necessarily provide anything ground breaking in terms of social media, but they do provide some level of integration with the major social media tools of the day. Where Oracle misses out a bit is, until recently, it still has a somewhat old-school approach to the cloud. For organizations committed to bringing their enterprise applications to the cloud, Oracle may not be the best fit. Though they have a cloud offering with a very clean UI, one wonders if Larry Ellison is really trying to push customers towards their cloud offering. Case in point, right now go to Oracle’s website and try and find me what the pricing is around their cloud based CRM solution aka Oracle CRM OnDemand. Can’t find it? Don’t worry, I couldn’t find it either. This is where Oracle misses. As more and more companies want ease of use and ease of adoption, Oracle still has a bit of an old school approach. This is inevitably reflected in their product focus as well. For the record, the onDemand offering from Oracle comes in around $45/user/mo assuming a one year contract and a minimum of 5 users. This edition provides slightly less bells and whistles than a similarly priced offering from Microsoft Dynamics CRM, however comes in at a lower price point than both SAP and Salesforce.com cloud offerings. Despite some of Oracle’s missteps, one thing that shouldn’t be ignored is Oracle’s ability to deliver is proven, just like Andre the Giant. Oracle CRM may not be as obvious a choice anymore, but depending on your organization size, existing systems in place and your specific needs, don’t count Oracle out. Check back tomorrow for Part 2, where we will pit the two current superstars against each other, Ultimate Warrior aka Salesforce.com v. Hulk Hogan aka SAP.